On the front cover, Transparent's breakout stars, actresses Alexandra Billings and Trace Lysette, talk about living with HIV onscreen (and, for Alexandra, offscreen) as well as sexual harassment in Hollywood and being a transgender woman in America. And on the bonus special back cover, Broadway and MTV star Todrick Hall talks to us about getting black gay and bi men (and the world at large) to confront the epidemic rates of HIV in their future if nothing changes. 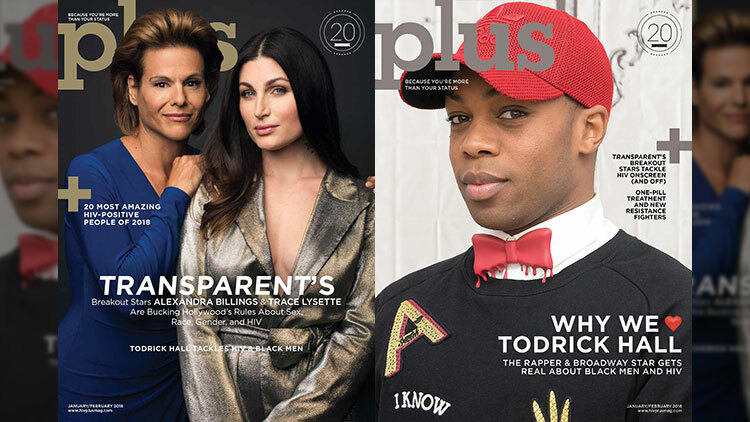 Plus: We kick off Plus magazine's 20th anniversary with the 20 Amazing HIV+ People for 2018.